A couple of weeks back, we reported about the unannounced Samsung device codenames spotted in the leaked Galaxy Note 8 Oreo firmware. Galaxy J4 and Galaxy J6 were also part of that puzzling list. 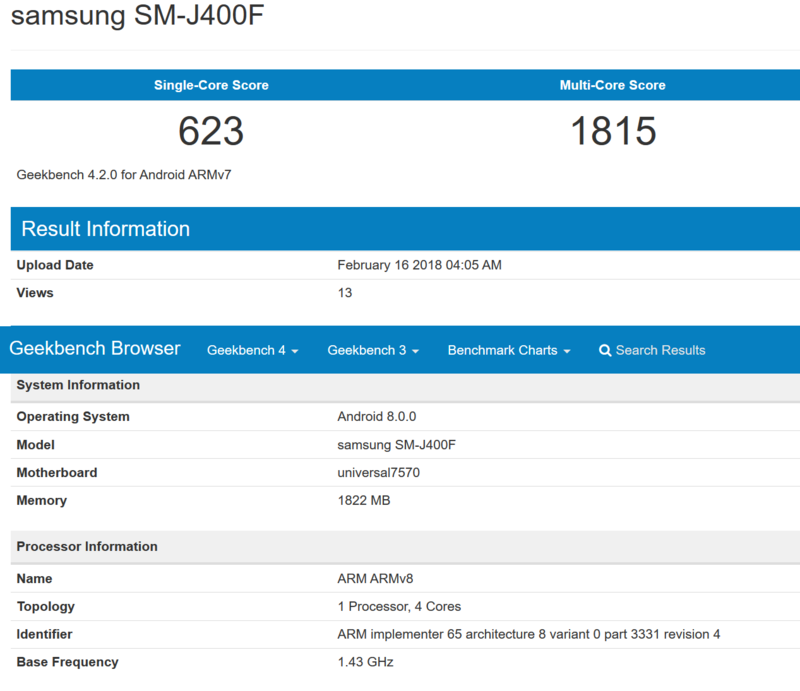 Adding more credibility to the existence of a Galaxy J4 in works, a Samsung device with the model number SM-J400F has been spotted in the Geekbench database. Though Geekbench results can easily be faked, it is very much possible that Samsung might be working on a cheaper Galaxy J series phone to strengthen its budget device line-up. According to the results, the alleged Galaxy J4 runs Android 8.0 and is powered by an unidentified quad-core processor clocked at 1.4 GHz and paired with 2 GB of RAM. It posted a single-core score of 623 and a multi-core score of 1815 in Geekbench tests. Although not confirmed, this could be the Exynos 7570 processor that already powers the Galaxy J3 (2017) and Galaxy Xcover 4. Barring these details, nothing else is known about the Galaxy J4 currently. Samsung has been struggling in the budget category with its devices failing to stand up to the value offerings from the Chinese OEMs. There were reports about Samsung revamping its budget line-up to better compete with the Chinese rivals. So, it won’t be surprising, if Samsung decides to launch more models in the budget category at aggressive price points to address the gaps in its line-up. some people just want SAMSUNG brand, not for performance, so can live with those low end with high price, so why those using high end SAMSUNG complaint? Oh dear!!! Another unnecessary phone from Samsung, unbelievable!!! how people can use a phone with this performance ? so times i see the s7 edge slow even if its super fast and a high end phone.. I had A5 2016, and now I’m using S7 Edge and sometimes it is slow. Not very slow, but sometimes it should be faster. Since I have a J3 (2017) phone, the performance is mediocre but the overall optimisation of the device is relatively good & I say that it overwhelms my dated Galaxy S5 (2014) model. It’s a tough position for Samsung to be in. If they’re budget offerings are bad (as they tend to be), they will lose against the competition. And if they make them good, they will face the risk of those phones potentially eating into the sales of the flagships. They are getting the A series wrong by pushing it more and more to the S series to accommodate the J series – and that’s not including the C and E series out there. I think they will eventually run into the same problem, with the A series being “good enough” for many people as they improve. The alternative is to leave them for years on stagnant specs (pretty much as they do with their budget tablets at the moment).